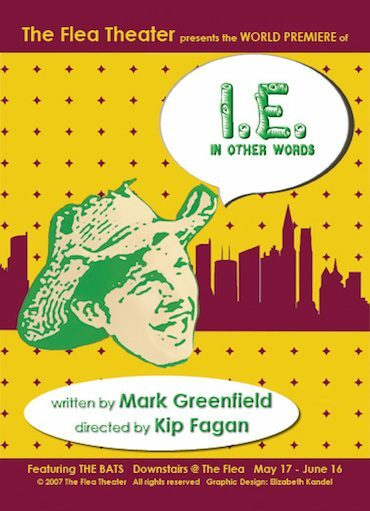 The Flea Theater presents the World Premiere of I.E., In Other Words by Mark Greenfield beginning May 17th. The production is directed by Kip Fagan and stars The Bats, the resident acting company of The Flea. Opening night is slated for June 1st. I.E., In Other Words is the simple story of a young man who believes that if he takes a chance he will realize – and achieve – his big vague dreams. With thirty-three characters played by a cast of fourteen, I.E. invites audiences on a rollicking trip from the country roads and kitchens of Localtownsville to the avenues and cafes of the big Citycity. Using highly stylized language, this Boy Meets Girl/Horatio Alger tale-gone-wild pares down playwriting to its most elemental components. Whether skewering psychiatry, geriatric desire, or the fecklessness of a young man who trades his heart for “something better,” I.E. maintains a sense of humor and pathos. There’s adventure, love, songs, and lots of punch lines. I.E. stars The Bats: Josh Adler, Teddy Bergman, Kina Bermudez, Havilah Brewster, Jaime Robert Carrillo, Garrett Hendricks, Bobby Hodgson, Beth Hoyt, Richard Kass, Malcolm Madera, Kelly Miller, Bobby Moreno, Mary Jane Schwartz and Rob Yang. The design team includes sets by Michael Casselli, lighting by Ben Kato, and costumes by Normandy Sherwood. Film producer Barry Mendel (Munich, The Sixth Sense, The Life Aquatic with Steve Zissou, The Royal Tennenbaums, Rushmore) first brought the script to The Flea after seeing a production featuring The Bats. Over the last year, I.E. was workshopped at The Flea. Mendel and Greenfield were so impressed with the quality of the young company that it was decided to premiere I.E. with The Bats. Mark Greenfield (Playwright/Composer) is the founding Artistic Director of The Faux-Real Theatre Company with whom he has created such shows as FUNBOX, William Shakespeare’s Haunted Houseand Htebcam (Macbeth in Reverse) and MasksHatsAndThangz. After ten years of creating large scale, sensory-oriented theatrical events using reconstructed texts, I.E. marks a departure for Greenfield. Mark has also directed for Gorilla Rep, with who he was a lead actor for five years. Other acting credits include performing commedia dell’ arte with I Giullari Di Piazza at Lincoln Center and touring with IMAGO. Mark can be seen this fall starring in Shadows of Las Vegas, the upcoming film from renowned Iranian film director Amir Naderi. Kip Fagan last worked at The Flea directing Christopher Durang’s Not a Creature Was Stirring as part of Twas the Night Before. Other NYC directing credits include: Sam Marks’s Nelson (Partial Comfort), Adam Szymkowicz’s Incendiary (The Juilliard School), MORT (HERE Arts Center; co-writer and director), and Sheila Callaghan’s Soak (Sanctuary Playwrights Theatre). Regionally, he directed the World Premiere of Craig Lucas’s Small Tragedy at The Playwrights’ Center in Minneapolis. Kip is a co-founder and former coartistic director of Printer’s Devil Theatre in Seattle. He was a 2003-2004 recipient of the NEA/TCG directing fellowship. This summer, he will direct Tommy Smith’s musical Koran Kountryat the Williamstown Theatre Festival. I.E., In Other Words runs May 17 – June 16, performance schedule varies.